When contemplating an investment, I might get excited about a company and want to immediately snap up shares of its stock. But I've learned that I should try to determine the value of the company and a fair price for the company's stock before buying. As a general rule, I don't want to pay more for a company than it is worth. Going further with this idea, I may decide to invest only if I can pay less than the company's value. If I adopt this philosophy, I buy shares of a company only when its price represents a bargain or discount from its value. That is, I incorporate a margin of safety into my investing decisions. Let's say I think (based on financial analysis) that the fair value of a Widget Company share is $50. If the price is $25, then there is a large margin of safety. If the price is higher, $40 for example, then the margin is small. If the price is $51 or more, there is no margin of safety. One of the difficulties in defining the price that represents a safety margin lies in calculating the intrinsic value of a company. There are many ways to establish value. I have been valuing companies using a cash flow method. Basically, I calculate the present value of future cash flows, which are based on current cash flow and a growth rate I expect considering past performance. Then, I calculate the price per share based on this value. After establishing the value, I apply the margin-of-safety principle by telling myself never to pay more than 80% of a stock's estimated value. The biggest problem I have with the margin of safety is that the price of a stock may never fall to the levels indicated for making a purchase. I can be an impatient investor, often fearing that I won't be able to participate in what I anticipate as being significant gains. However, I have noticed — based on price fluctuations — that adhering to a margin-of-safety policy is wise, particularly if I'm buying a growth stock. In fact, I've considered using a margin of safety for growth stocks that is greater percentage-wise than more established offerings, such as blue-chip stocks. For example, my margin for a growth stock (representing a relatively new company that seems to be growing rapidly) could be 50% whereas a margin for a blue-chip stock could be 10%. The reasoning for this approach is that blue-chip companies tend to have more predictable results whereas growth companies are less predictable and harder to value. To get a better perspective on safety in investing, I might think of margins that I deal with daily. For example, when I ride in a paceline (cycling in a line so that the person in front blocks the wind, enabling those in the back to expend less energy), I may allow extra space between the back wheel of the person ahead of me and my front wheel. This margin-of-safety approach requires me to work harder; but it also allows me to avoid an accident if the person in front makes an unexpected move. Similarly, suppose I'm an engineer developing the plans for a bridge. I may have specifications indicating the amount of weight that should be supported by the bridge. To that number, I might add a safety margin. I could incorporate building materials or design features to support greater weight than anticipated or required. I'll spend more upfront but be more likely to avert a disaster. Much of the teachings of Benjamin Graham involve preventing loss. 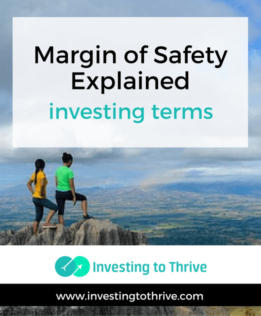 Using a margin of safety in investing decisions may keep me from buying a high-growth stock with potential for above-average returns. But it can prevent investing mistakes, which may allow me to experience greater returns by limiting losses on certain investments.